This simple tutorial will explain how to disable or change the Alt+left mouse from moving windows in Ubuntu 12.04 gnome-shell and unity desktop. There used to be a built-in utility for switching this movement key to an other in Gnome 2. I don’t know why ‘Move Window’ plugin in CCSM doesn’t work in Ubuntu 12.04. Now I think the best way to disable or change Alt key and left mouse from moving windows is using dconf-editor. This will take effect in both Gnome Shell and Unity while settings in gconf-editor only work for Unity. Now, launch dconf-edtior and navigate to org -> gnome -> desktop -> vm -> preferences. switch to other keys, such as <Ctrl>, <Super>, etc. Holding down the key will not only move windows by left mouse, but also resize window by middle mouse and show window menu by right mouse. 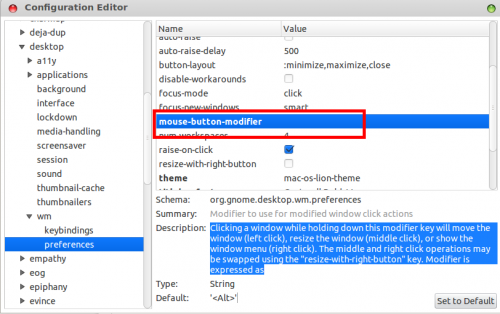 No user responded in " Disable Alt+Click Moving windows in Ubuntu 12.04 "